You know from experience that people who fit their job are more productive, cause less problems and waste less management time. Unfortunately, traditional hiring strategies yield inconsistent results because the two factors with the highest correlation to hiring success (behaviors and cognitive ability) are almost impossible to accurately measure using a traditional interview process. Adding objective information from an assessment will give you valuable insights into candidates that can make the difference between hiring a top performer and someone who turns out to be only average – or worse. Have You Ever Hired Someone Who Turned Out To Be Worse Than Expected? Thirty years of research shows that the traditional resume / experience / education / interview selection strategy has an inconsistent correlation with hiring a top performing employee. 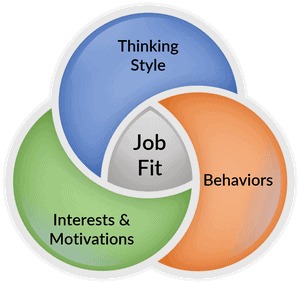 Behavior (not personality) and cognitive ability are the two factors with the highest correlation to hiring success and they are almost impossible to accurately measure during a traditional interview process. The proper assessment adds this objective information to an otherwish subjective process. The amount of information available on the internet makes it easy for candidates to know what you are going to ask before you ask it. They are well prepared in advance with perfect answers that are designed to get them the job, not help you hire the right person. A modern hiring assessment can generate customized interview questions that help you explore candidate strengths and weaknesses in a way that they won’t be prepared for so that you can hire more top performers. You know that just like anything else, it takes study and practice to become an expert and get consistent, predictable results. Even if you’re an HR professional, you might not have time to study and practice the art and science of hiring and interviewing. If you are a business owner, executive, or hiring manager, you are busy running your business and may not hire frequently enough to become an expert. Fortunately, the right hring assessment can give you the information you need to put the right person in the right job. We also provide a library of over nine hundred Performance Models that reflect the characteristics of people who have been proven successful in a job. We can also create a customized Performance Model that reflects a specific job in your company. For over a decade I've been helping organizations of all types and sizes use assessments to optimize their hiring process. I'll answer your questions and make suggestions and recommendations based upon my knowledge and experience. 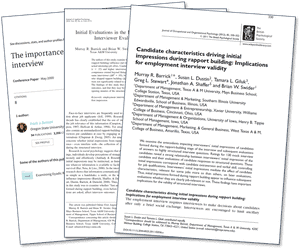 Judgements made within the first 20 seconds of the interview significantly affect the outcome on an interview. We tend to ask slightly different questions with slightly different voice tones to people we like and people we don’t like - and we interpret their answers differently. This effect is known as the “Hero & Horns Effect” and can be so subtle that we don’t know that we’re doing it. The best way to compensate for Hero & Horns is to add the objective data from a validated hiring assessment to your process. 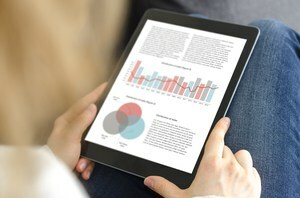 Assessments can provide you with easy-to-read and easy-to-understand reports that quickly show you how your candidate compares to the thinking style, behaviors, and motivations that are likely to make someone successful in the position they are applying for. The reports even generate customized interview questions that isolate on the challenges and strengths or the candidate – and they won’t be prepared for. Use these insights to hire top performers by identifying potential problems before you hire. Once a candidate or existing employee has completed an assessment, their information can be used at no additional cost throughout their entire career to hire, manage, and develop them. This gives you a cost effective and practical way to help everyone be more productive, solve management problems, and develop the potential of every team member. If you have people, there will be problems. Unfortunately, few HR professional, business owners, or managers have the background in psychology to diagnose the personality and behavior problems that arise in today’s workplace. You know from experience that ten percent of your employees (you might even be thinking of someone right now) cause ninety percent of your problems and our assessments can give you insight into the causes and solutions to many of these problems.